Never Enough Nails: SinfulColors Spring Fever 2015 Swatches! Happy first day of spring!!!! I have spring fever today with some of the polishes from the SinfulColors Spring 2015 Spring Fever collection (even though it's supposed to snow 4+ inches later today, WTF??!!). 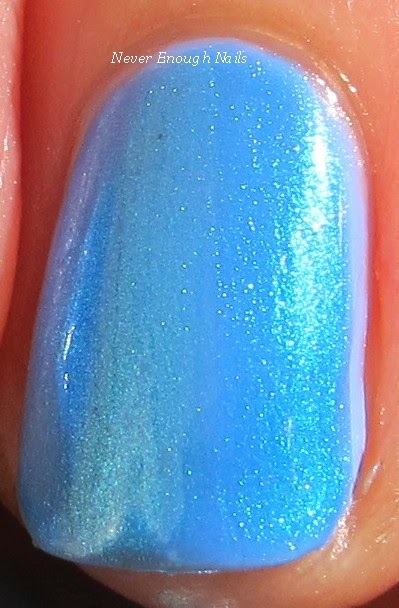 First up we have the beautiful Forget Me Not periwinkle blue creme, SinfulColors Sail La Vie. I love colors like this for spring- flower colors! Sail La Vie is not quite a pastel, it's a little more saturated, but still has a fresh soft feel to it. I think this will be my first spring pedi! This is three coats of Sail La Vie. It was on the thin side and seemed pretty sheer on the first coat. However, it built up to full opacity nicely in three coats and was pretty good to work with. SinfulColors Prized Plume is an "opalescent trend topper", a topper that can add a beautiful iridescent shimmer to any polish. Prized Plume is described as a "iridescent peacock feather blue" and it flashes a little green here and there too. I layered one coat of Prized Plume over Sail La Vie for this look. It looks different in different types of lighting, sometimes it leans more green and sometimes more blue or teal. Very pretty! Prized Plume was very easy to apply and had a great consistency. It is marketed as a topper and I think would take a ton of coats to wear it alone. This is just one coat over Sail La Vie and it's perfect. SinfulColors Gold Medal is a pretty metallic gold shimmer. It is a very reflective gold and my pictures were not coming out that great with this one. I like it in person much better than in my pictures. This is two coats of Gold Medal. It applied well, but it does have some visible brushstrokes. 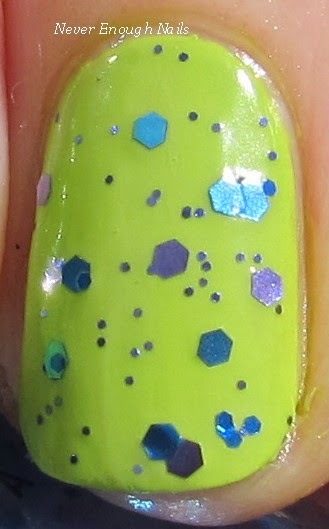 This bright apple green creme is SinfulColors Innocent. This is a great spring color, an electric yellow-y green, like the new shoots of plants peeking up in the gardens. I am a fan of weird greens, so I love this color. I do not love the formula of Innocent, however. It's thick and hard to apply smoothly. It doesn't seem to self-level. Despite being thick, it also came rushing off of the brush to flood my cuticles, despite the fact that I wiped off the brush quite well. A layer of top coat seemed to even it out, but clean-up was definitely necessary and even with clean-up, my cuticles are stained yellow-y green in places. So, while I love the color, I wish this was a little more user-friendly. My favorite look of this collection is SinfulColors Petal Be the Day over Innocent. This screams spring to me and I love these colors together! Petal Be the Day is a "Bloomblast Glitter" with royal blue and purple glitters. 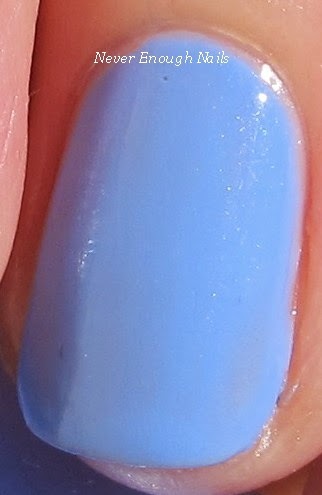 The base looks like a milky lavender in the bottle, but it's really just clear on the nails, so I chose to layer this. This is just one coat of Petal Be the Day over Innocent. It was nice and easy to apply and the glitter was plentiful. The SinfulColors Spring Fever collection is available now at Walgreens and other retailers. My favorites are Sail La Vie and Petal Be the Day. For more information about SinfulColors, check out their website SinfulColors.com, Facebook page, Twitter, and Instagram. Me too Ananka! It makes a nice spring look with the green!